We visited the Polo Lounge at The Colony Hotel in Palm Beach this week for lunch by the pool. A casual but refined space, the Polo Lounge features a dining room – complete with photographic wall murals of gameplay – separated from the bar by a baby grand piano. The outdoor patio overlooks the pool and has the perfect touch of Palm Beach. We were seated outside and brought a basket of bread and menus to peruse. I loved the effortless elegance of the patio with wicker chairs, white linens and green water glasses. We started off with the Chilled Gazpacho with Creme Fraiche. It was bright and spicy and the bowl was left wiped clean. I began with the Watermelon & Plum Tomato Salad which was a caprese salad of tomatoes, fresh basil and mozzarella drizzled with balsamic and accompanied by melon balls of sweet watermelon. It was light and fresh – just right for Summer. For an entree, I ordered the Chicken Curry Salad with raisins served with sliced apples and an English chutney over mixed greens. It was vibrant, flavorful and delicious. I loved the sweetness of the chutney with the curry. My guest had the Gulf Shrimp and Baby Spinach Salad which was topped with feta cheese, applewood smoked bacon, red onion, candied pecans, green apple, dried cranberries and a lemon vinaigrette (although she stole the creamy balsamic dressing from my plate). The shrimp were large, pink and covered in spices. It was a beautiful salad full of texture and flavor. We finished off the meal with a slice of Key Lime Pie, one of my personal favorites. It was decorated with white chocolate spears, a luscious strawberry and whipped cream. I was light, tart and the perfect bite to end the meal. 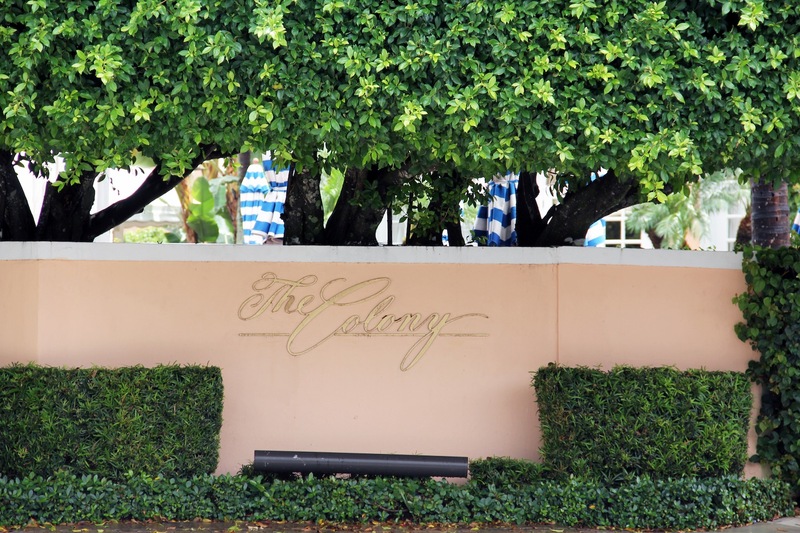 The Colony Hotel is a staple on Palm Beach since 1947, with colorful Carleton Varney guest rooms, a who’s who guest book, and stunning event space. It is home to the Polo Lounge, Palm Court and Cafe 155. If you haven’t been, I recommend making a visit. Whether you are a local or visiting the area and considering the hotel for your stay, you are sure to have a wonderful experience.